The term “glazing” has many vague meanings when it comes to cabinet refinishing. Often times homeowners ask me to glaze their cabinets, when really, they want them to be distressed. Glazing is when you use an actual glazing medium mixed with a paint. It can be applied in several ways: rubbed all over the surface of the cabinets or on select areas of the cabinets, like crevices or indented portion of the panels. Distressing is when cabinet refinishing person either paints the “under-color” over the painted surface onto the routers and/or edges, or when the painter sands away the paint to reveal the paint underneath the basecoat(s) of paint. When deciding on colors, you may want to experiment on sample doors (can be bought at your local Habitat for Humanity stores for under $15). Try oil-based as well as latex. Personally, I LOVE Benjamin Moore’s IMPERVA oil-based paints. Very durable. 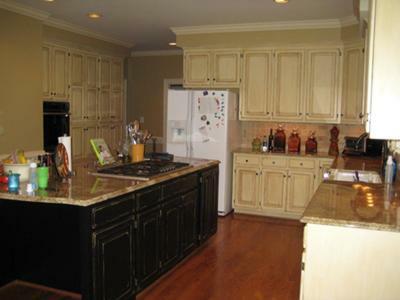 A trustworthy cabinet refinishing artist will either provide sample doors to show you his/her range of work. Or, if no samples in stock of what you are looking for, then one should be custom-made for you. This saves everyone time and money. As a faux painter and cabinet refinishing artist for many years, my advice to great finishes is PROPER PREPARATION! 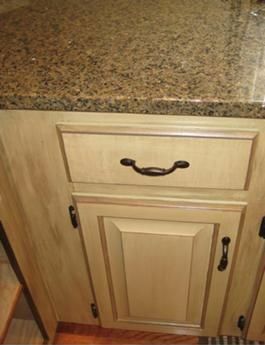 Cabinet refinishing is NOT a 2-day weekend project. There are many steps needed to ensure that the final finish is perfect and long lasting!